In recent years, consumers have been steadily altering their purchasing behavior. According to a study conducted by UPS and published last year, over 50% of shopping is now conducted online, up 2% from the previous year. People are purchasing everything from groceries to personal care items on the internet, so no matter what your online shop carries, there is potential to increase your customer base. 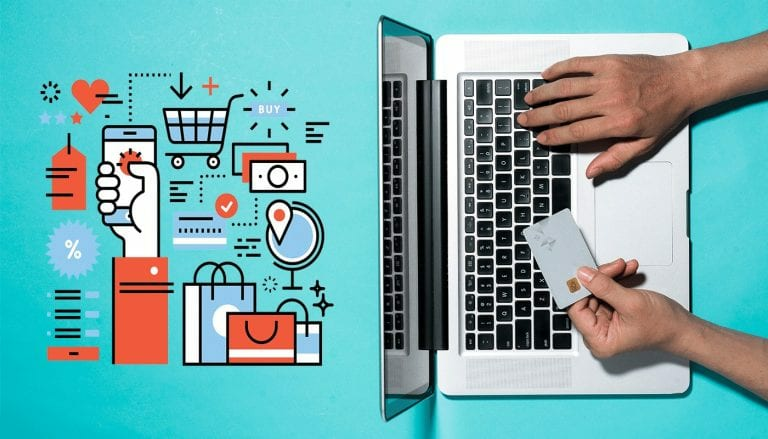 With e-commerce availability on the rise and competition strong, implementing smart e-commerce marketing strategies is more important than ever. What’s leading the charge away from brick and mortar establishments to virtual stores? It turns out, plenty. As consumers, both old and young, become more skilled at–and comfortable with–using technology they instinctively turn to the e-commerce marketplace to make their purchases. Consumers utilize e-commerce to comparison shop and make more informed decisions, guided by online reviews. In fact, research shows that 90% of consumers base their purchasing decisions off positive online reviews. Social media is used now more than ever, and no matter the platform, users are flooded with sponsored ads on their social feeds and homepages. Pay-per-click (PPC) advertisements, like Google AdSense, appear on most websites these days. PPC ads are highly effective because tracking codes associated with these ads allow marketers to target potential consumers directly. These days, merely setting up an e-commerce platform for your product or services isn’t enough. If your online store isn’t marketed properly, potential customers could be lost. Reap maximum benefits from all your e-commerce efforts by implementing the following marketing strategies. Automated email marketing campaigns can be very successful at driving traffic to e-commerce sites. These emails generate sales for your online store by keeping subscribers engaged through exclusive deals or new product updates. You can also tailor your email marketing to specific segments of your customer base. Create abandoned-cart reminder emails or occasion-specific emails with special savings on holidays or customer’s birthdays. Or you can use a more sophisticated method of email marketing, called drip campaigns. Drip campaigns are a set of emails meant to engage and educate customers, sent at strategic times until they complete a purchase. Customer loyalty and rewards programs enable you to collect user information that can drive remarketing efforts. These programs incentivize customers too. Consider setting up loyalty programs that offer exclusive deals, discount codes or free shipping. The potential to save is the number one reason users subscribe to get company email updates, so use this to your advantage. Social media presence is crucial for most companies, but especially for those with an e-commerce component. The success of your e-commerce store is dependent on website traffic. There is no better place to solicit page views than social media. Set up social media accounts on all the popular platforms (Facebook, Snapchat, Instagram, etc.) and diversify the content you publish to each. How you diversify content depends on the different platforms and the demographics of your audience on each. You don’t need to create more content for diversification, just modify the way you present the content on social media. For instance, simple reformatting of content depending on the platform engages different sectors of your audience. The most important part of your e-commerce website is the checkout page. If users run into trouble or encounter website glitches at this stage, they almost certainly will abandon their carts, which costs you money. Set up split testing (also called A/B testing) to compare two versions of the checkout page against each other. Use similar variants and analyze the results. The page that delivers a higher conversion rate wins. Consistently analyzing your checkout process can help you increase sales because you’ll be able to determine what best resonates with your audience. More consumers are using smartphones than ever before and have come to expect mobile responsiveness on their favorite websites, including e-commerce shops. Mobile responsive optimization guarantees that your e-commerce website is still legible when viewed from mobile devices like tablets and smartphones. Implementing a responsive interface improves user experience, which increases the chances of your customer returning. A lightbox popup is one way to grab your users’ attention and collect relevant information. When implemented strategically, lightbox popups can feel natural to customers and can encourage specific behaviors to complete website conversions. Lightbox popups are usually added to your website through a widget and can be set up for email subscription lists, downloadable whitepapers and guides, contest entries and much more. The e-commerce marketplace is a complicated space to navigate and enlisting the help a professional team might be the smartest marketing strategy of all. If you have questions about e-commerce or any other sort of digital marketing strategies, contact Front Porch Solutions. We utilize growth driven marketing strategies to inform website development, brand building, targeted leads and more.